As promised, a picture of the PPR E6 as presented to N-Stars (photo courtesy of Marc Starmans). Unfortunately the bell (a separate item) didn't survive the printing process so I'll need to give that a quick revision this week. 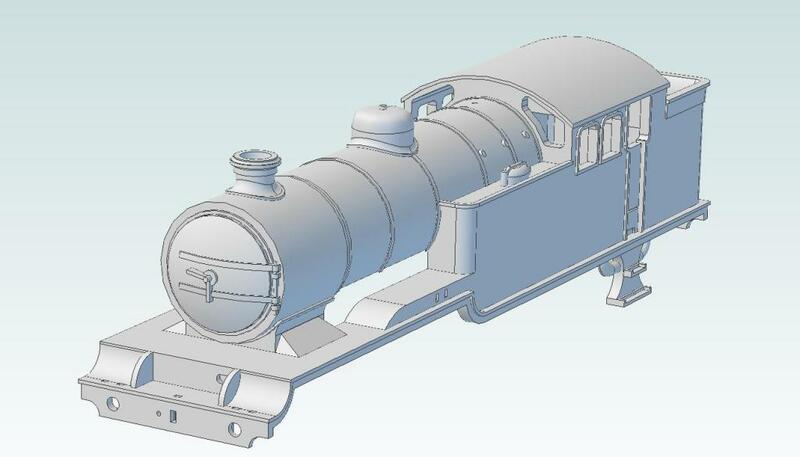 Another fabulous job Steve, the sheer complexity of the shape of this loco will have been a huge challenge I am sure! It is the most complex locomotive I've completed to date, both the boiler and firebox presented some interesting challenges to overcome. It isn't the most difficult locomotive body I've attempted though, that honor goes to the streamlined B17 and I've still not managed to come up with a method to successfully render it in CAD! I think that the original P2, 2001, comes in a close second but I think I might have figured that one out now - it is quite deceptive in how complex it actually is! Thanks for the word - I'll be looking at the chassis closely - ever hopeful for a V09 or a Z! The issue with both the V09 and Z is the location of the cylinders in relation to the running plate. 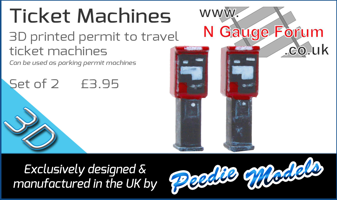 The fact they pass through the running plate makes life very difficult with regard to the slide bars and motion. The C1 is theoretically easier but I'm still to come up with a solution that'll work with a standard one - 3279 that I have build is a very different animal which allowed the easier incorporation of the standard Farish cylinders in relation to the running plate. Never say never, but I'm struggling to see how this can be achieved in N while keeping things looking reasonably proportioned. I've so far resisted the temptation to do one, just can't figure how to go about it! Indeed! The 'Paddleboxes' were wonderful looking locomotives but not the easiest things to model in 4 or 7mm scales let alone N! I'm not a fan of the rebuilt version though. A bit of a quick and dirty modification of one of my earlier designs the K3. Now adapted to represent a K3/1 with GNR cab in around mid 1930's condition. Besides the GNR cab, I've also converted the K3 to right hand drive but have yet to discover if the boiler fittings had been replaced with 'standard' K3 ones by this point. I've retained the cut outs on the bufferbeam every picture I've seen of the original ten K3s in the Thirties have this feature. The loco will end up being paired with an LNER flared tender as they all appear to have lost their GNR ones by this point. All had been rebuilt with side window cabs by nationalisation. Something to add to my list of things to print once the final part to service my printer finally arrives! Still no working printer so I've been having a go with the CAD again. Today's progress, which still requires a lot of detailing work, as well as accounting for at least some of the many variations of this class(es). Hopefully it'll fit onto a modified N class chassis. Lovely work Steve. LNER tank locos in N is the most obvious gap that the "Big boys" have yet to address at all (There has been little news of progress regarding the J72 Bachmann announced after what must be three years). I look forward to seeing this one develop. Thanks Roy. I agree that LNER tanks locomotives are rather poorly represented in N gauge without a single example being represented by the current generation of rtr locomotives (the GF J72 and DJM J94 being the obvious exceptions when they eventually appear). When you consider that all of the big four had a great many tank engines, I'm surprised that so few are represented to current standards. The V1/V3 is something that I've wanted to have a go at for quite awhile now and I know that at least one other forum member will be interested in it. I've got to sort out why the cab looks over length (in profile) today; all the key dimensions check out so I've been left scratching my head so far. I've got one other tank engine planned for the N class chassis and anyone knowing the history of that prototype should be able to work out what that one will be (when it gets designed!). Which version is the 10xx? The original 4-4-0 or the Hawksworth 4-6-0? Best chassis for it? 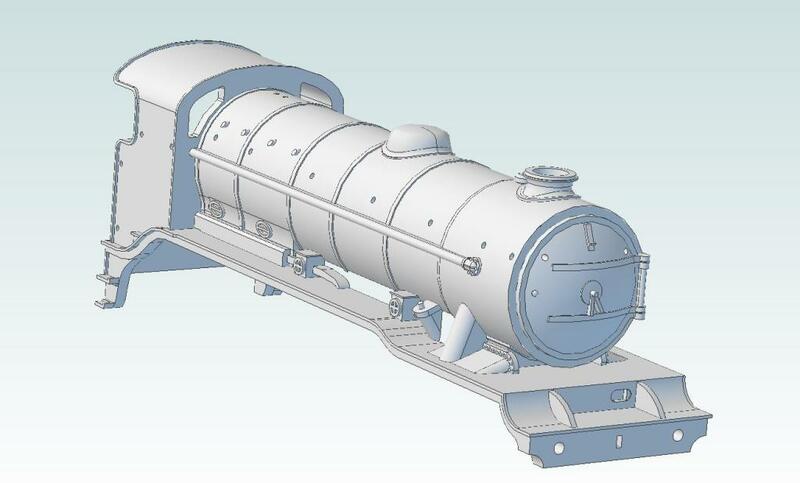 One just about completed CAD for an LNER V1 in original condition. This is as far as I'm going to go until I've had a chance to get a test model printed. Once I'm happy with the fit on the body, I'll see about doing some of the other variants in the V1/V3 classes.